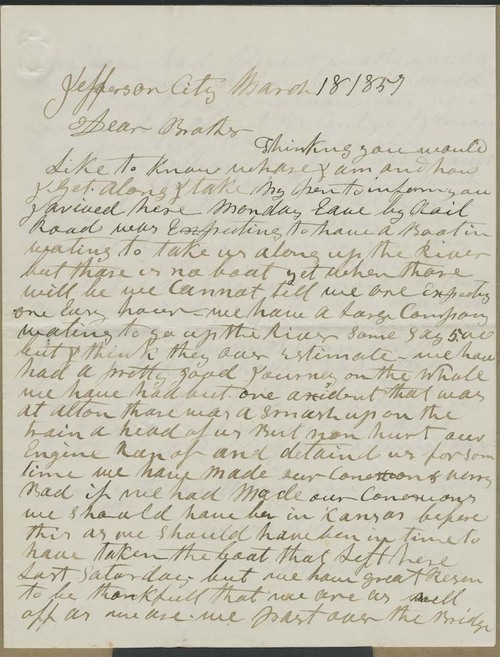 Hiram Hill, en route to Kansas Territory, wrote from Jefferson City, Missouri, to his brother back east. Hill reported that the journey so far had been pleasant, though they had been delayed by a train wreck and were currently waiting for a boat to take them up the River. He mentioned his experiences with border ruffians, finding that they were "civil" unless they "get too much whiskey down". Hill lamented the resignation of Kansas Territory's Governor Geary, but related that he saw the new marshal, who was on his way to K.T., in St. Louis.